There's no greater instrument for good than a caring heart — in fact, that's what sets the stage for miracles. Just ask the Bingham family, and the little creature who's alive today because of them. The Binghams were gathered outside the family's cabin in Utah on a white Thanksgiving morning, when they discovered a lifeless stray kitten who had gotten buried beneath the freshly fallen snow. Despite the fact that he appeared to be frozen, with no detectable heartbeat, the family rushed him inside to try to coax the kitty back to life. Incredibly, after being warmed by the fireplace and resuscitated with some gentle CPR, the kitten slowly but surely began to recover — an outcome the Binghams are calling a miracle. They named the cat Lazarus. We may never know what led little Lazarus to become abandoned and left exposed to the freezing elements, but the kindness that saved him that morning couldn't be clearer — or more enduring. Lazarus was adopted by one of the family members, and has since been given a clean bill of health, ready to start out life fresh, happy and warm in his loving new home. 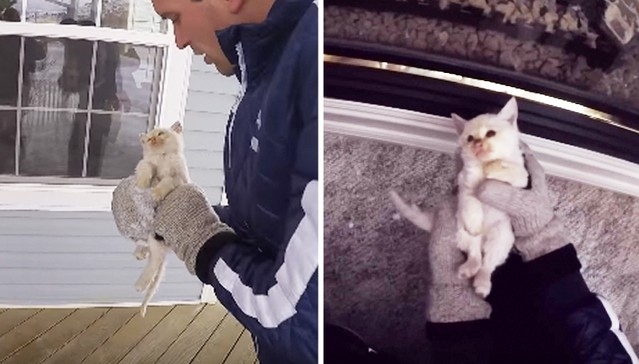 Responses to "Early Christmas Miracle: Family Finds A Frozen Kitten, Then Brings Him Back To Life "
Excellent efforts.. and an outstanding lesson in compassion and patience for the whole family. Idrea - CPR has been proven effective in saving lives of many species - and for a kitten so young, he was doing it correctly - including not giving breaths. It's very easy to get overly excited and puff far too hard into the mouth and nose of smaller victims and explode their lungs. I'm a retired paramedic, retired nurse, and retired animal rescuer. I'm so thankful for people like the Binghams. The Binghams (and anyone else who lives in areas that get freezing temps) might benefit from reading Frosty's story. She was found in a barn and brought to the rescuer who still cares for her at 8:30 pm, Dec. 30, 2013. She was frozen solid. It's a wonder she could be brought back. She can't control her temp because of damage from being frozen, so she has to wear clothes to help her stay warm. I hope that Lazarus has no lasting effects from his ordeal and that his new owner has many WARM happy years with him. White Wolf Pack, thank you for sharing his story. I love cats. This story warmed the cockles of my heart so much that they melted & ran down my cheeks. I don't think they should have fed the kitten quite that soon because sometimes the stomach isn't yet functioning properly. Otherwise, they were spot-on. How wonderful that these people cared enough to even try to save Lazarus & that God restored him through their efforts. Wonderful caring people & great Rescue!